The following settings are available from the Translate Files dialog box. Browse for the directory from/to which the files will be translated. Use the scrolling arrows to scroll through the available directories. 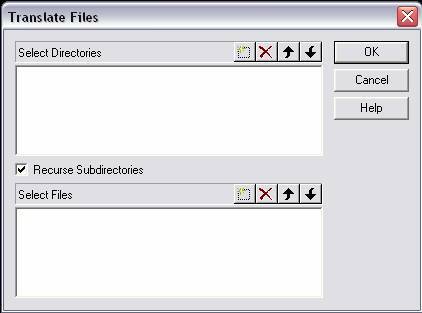 When selected, all sub-directories and files under the current directory will be translated. Select the files in the specified directory that you intend to import/export. Use the scrolling arrows to scroll through the available files.